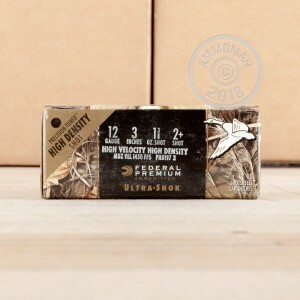 Federal Ultra Shok High Density shot shells are a premium choice for waterfowl hunters. 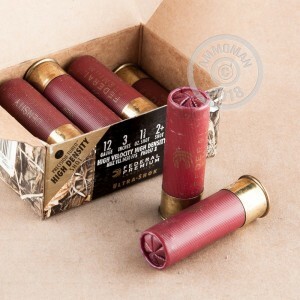 These shells utilize a tungsten-iron shot that allows for a higher payload when compared to standard steel shot rounds. Each shell holds 1-3/8 oz. of #2+ shot and has an average velocity of 1,450 feet per second. Federal Ultra-Shok shells are lead free but the soft tungsten-iron shot is up to %20 softer than compatible steel shot. Each box contains 10 rounds that are loaded in Anoka, Minnesota. If you are planning on stocking up for the season, all orders over $99 at AmmoMan.com receive free shipping!